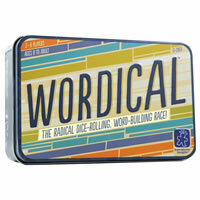 If you are into word game, this is a great one to pick up due to how portable it is. All you'll need are the consonant cards and the vowel dice to play. No game board or complicated scoring multipliers. Easy to play, quick, no huge complicated words, scoring isn't complicated (see the rules below for exact scoring instructions) and great for kids eight and up. Wordical will get you spelling and thinking of short words. With the use of wild cards, you can create quite a wide range of words with fairly few letters. The price and portability of Wordical makes this a keeper. Game adapts to the skill level of the players. Learn more about the card game Wordical below and let us know what you think. Get the highest amount of point and you get the title of winner. Included is 108 consonant cards, 2 vowel dice and the official Wordical game rules and instructions. Please keep in mind that the official Wordical dice-card rules and instructions could be different depending on the game version you have. The rules below are some of the exact directions on how to play Wordical. Share with us your comments, funny stories, tips, advice, strategies, creative ways to play, questions about how to play, problems with the rules or anything you want about Wordical. All submissions will be reviewed within 24 hours. Click here to add your Wordical comments.